What follows is my take on some math problems of supposedly "common core math" or "new math" that have circulated on the internet. I feel they show us a misdirected implementation of the CCS. Keep in mind, not everything you see in math books or on the internet is properly done based on the CCS. In some of the examples you see, it looks like people are throwing out common sense when making math problems to address the common core standards! I am not surprised that the implementation has ended up "botched" in some places. The CCS are such a change to most teachers that they need lots of support and re-education before they are required to teach to them. I have always thought that the MAIN problem facing math education in elementary grades in public schools is that many elementary teachers do not understand mathematics sufficiently to be able to teach it right even in elementary level. For example, many of them do not understand the concepts, the why's and wherefores of the algorithms they teach. It's not their fault - the problem traces back to what they were taught in teacher training and in their own schooling. Even the standards document itself is somewhat hard to follow in places. Reading it requires some thinking. I wish someone would produce a booklet that explains the standards in simple language and with numerous examples. 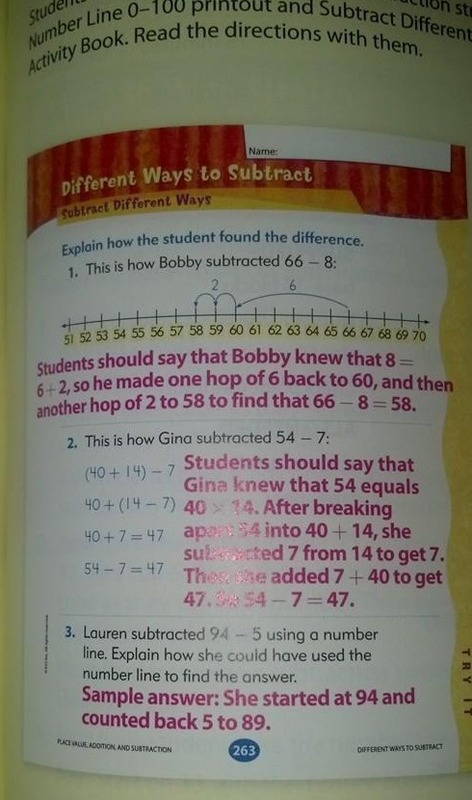 Bad examples of "common core" or "new math"
Recently I saw an image of subtraction strategies on Facebook that claimed it was from a 1st grade math book and was "Common Core math." I think method 2 is way too difficult for 1st grade, and I'd leave even method 1 for 2nd grade. However, that book doesn't seem to even align with the Common Core standards. The standards for 1st grade simply don't include those kinds of subtraction problems! Add and subtract within 20, demonstrating fluency for addition and subtraction within 10. Use strategies such as counting on; making ten (e.g., 8 + 6 = 8 + 2 + 4 = 10 + 4 = 14); decomposing a number leading to a ten (e.g., 13 − 4 = 13 − 3 − 1 = 10 − 1 = 9); using the relationship between addition and subtraction (e.g., knowing that 8 + 4 = 12, one knows 12 − 8 = 4); and creating equivalent but easier or known sums (e.g., adding 6 + 7 by creating the known equivalent 6 + 6 + 1 = 12 + 1 = 13). The textbook example seems to want to address 1.OA.6 above, but that is clearly for adding and subtracting within 20, not with larger numbers. Maria's note: this means subtractions such as 34 — 20 or 89 — 60. Note that the 2nd grade standard does not specify HOW you subtract (whether you use mental math strategies or write numbers under each other and borrow/regroup). Juanita wants to give bags of stickers to her friends. She wants to give the same number of stickers to each friend. She's not sure if she needs 4 bags or 6 bags of stickers. How many stickers could she buy so there are no stickers left over? Sure, the problem is VERY unclear and poorly worded. My guess is that the booklet this appears in is simply unedited. It's not the fault of the standards themselves. I agree with Bart Goddard on Math Forum. This is a symptom of the blind rush to produce "real-life" story problems that end up being nonsensible. From the PDF document it appears in, I conclude the problem is for fourth grade, because all the other word problems in the booklet match standards for 4th grade (factors, primes). But, the CCS don't even include the least common multiple in 4th grade standards (it's in the 6th)!! Something went really haywire with that word problem. Now, first of all, the strategy of "making ten" has to do with ADDITION, not subtraction. In subtraction, it is called "decomposing a number leading to a ten". So the instructions should say, "Which shows a way to decompose a number leading to a ten?" I feel it is utter NONSENSE to require 1st grade students to know such terminology. But there's another problem here. If you actually read all of the standards, you will notice that in several other places it asks students to explain the reasoning used or to relate a certain visual method to the strategy, but NOT in this standard! The way I see this standard is that teachers are supposed to TEACH the various trategies mentioned and then give students SIMPLE addition and subtraction problems within 20 such as 15 − 8 and 10 − 6. I do NOT see this standard requiring students to recognize if a certain visual model matches a certain strategy. Again, it looks like the author throws out common sense... and does not actually understand the standards. The example below is very poorly worded but the CONCEPT behind it is very good and is also found in Math Mammoth. I can therefore figure out what they want. You see five squares. Color some blue and the rest red. That's clear. Then color the squares in the "number bond" the same way. The number bond goes to those three circles. A child that has been present in a lesson where the teacher teaches number bonds hopefully knows what it means. 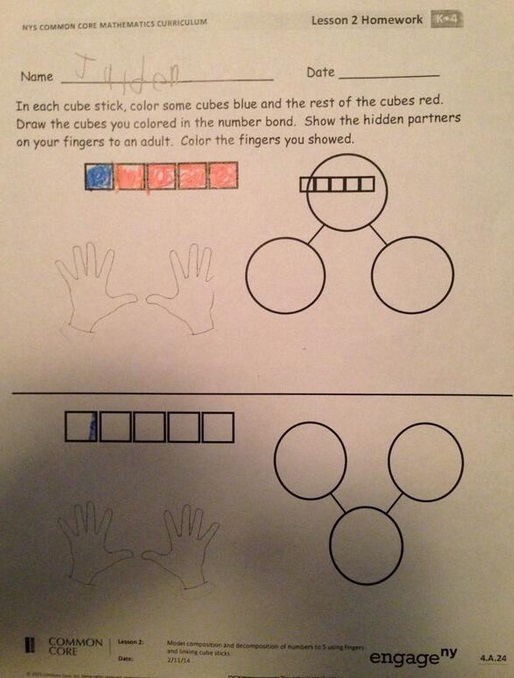 It's the same concept as a fact family... the top number is the sum or the total (5), and the numbers that go to the bottom circles correspond to how many you colored blue and how many red, in this case 1 and 4. Then I think the hidden partners are also the 1 and 4. Show 1 and 4 fingers to an adult. Lastly color 1 and 4 fingers in the picture (and not your own fingers like it sounds like). Understand subtraction as an unknown-addend problem. For example, subtract 10 − 8 by finding the number that makes 10 when added to 8. Add and subtract within 20, demonstrating fluency for addition and subtraction within 10. I don't know why that number bond worksheet is given as an example of Common Core Math. It would be much better titled as an example of poorly worded math worksheet that COULD even date to pre-common core (and is just re-used in this particular curriculum)... because like I said, number bonds are NOT mentioned in the CCS. Maria's note: these are your basic addition facts, such as 7 + 7 or 5 + 4. Maria's note: this means multiplication tables and basic division facts. Maria's note: this does not mean that students multiply multi-digit whole numbers only in 5th grade; that is studied also in 3rd and 4th grades. Notice the "and/or" in the above sentence. This means the teachers and students are NOT limited to using any specific strategies nor told to use several strategies. The traditional "borrowing" algorithm is a strategy based on place value so it is included right here in 2.NBT.5. Explain why addition and subtraction strategies work, using place value and the properties of operations. Explanations may be supported by drawings or objects. It says "may be supported by drawings" but it does not force you to do so, nor limit you to using a specific visual model or type of drawing. The student does not HAVE to use a drawing. That is just mentioned as a possibility. Notice the "and/or". Illustrate the calculation but it's sufficient to illustrate it using equations. You do not HAVE to illustrate it using arrays. That said, some standards do mention a specific visual model, such as a number line or rectangular area model but that is less common than giving a choice like in the standards above. One such story problem would be: how many pieces that are 1/5-ft long can you cut out of a 4-ft piece of material? A visual model could show 4 wholes, divided into fifths. We can then count that 4 wholes have a total of 20 fifths. This means for example a rectangle with side lengths 3/4 km and 4/5 km. Then we tile it with little unit rectangles (not unit squares; here the standard itself has the wrong terminology) that each have side lengths 1/4 km and 1/5 km. We can count how many little tiles we need. We need 12 such tiles. Each tile has an area of 1/20 km2, so the total area is 12/20 km2. Then we check and compare that we get the same answer as if we had multiplied the two side lengths using regular fraction multiplication (3/4 km × 4/5 km = 12/20 km2). I have always had these kinds of problems in my books—even before CCS came along. Some people argue that children don't need such conceptual understanding or that it is too difficult. Personally, I disagree. I have always (also before the CCS) striven to explain the concepts of fraction arithmetic so that students don't end up "blindly following the rules", only able to calculate with fractions if they happen to remember the rule correctly. I have always emphasized the conceptual understanding in mathematics (as my readers know!). But, I hope you can see how some of these things can be unfamiliar to school teachers and parents, and therefore it is no wonder that following Common Core Standards is difficult for them. It is my hope that Math Mammoth Light Blue Series and the units I sell at my Teachers Pay Teachers and Teachers' Notebook stores can help those teachers & parents who need Common Core aligned materials. And like I said, the rest of you can be confident in using them as well. They don't contain any "strange" or nonsensical math, but as always, are simply based on the solid foundation of teaching the concepts of math along with the procedures.